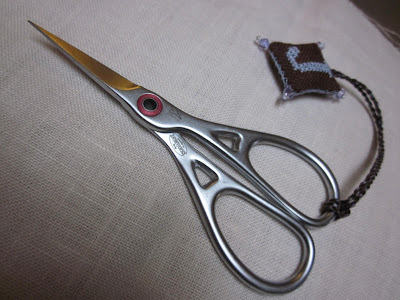 Adventures in Stitching: My Scissors -- from Italy! Ackk I just finished this whole post and then Blogger ate it so I'm doing it over. Happy Friday anyway, everyone! I have two pairs of Italian-made scissors. 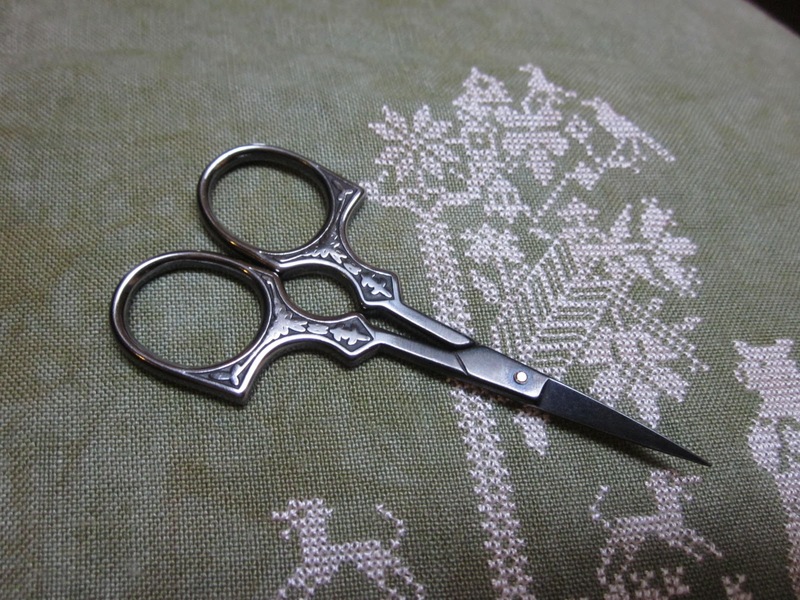 This first pair is one of my favorites to look at- I love the rubbed black finish that shows through silver in the high areas, and I love the hook-style handles. This style handles suits me well since I usually put my thumb and middle fingers through handle loops and steady the blade with my index finger, rather than put my thumb and index finger through the handles. The one thing I do not like about this pair is that the action is not as smooth as I would like. I fix this somewhat by putting a tiny dot of sewing machine oil near the screw, but of course then I must be careful oil doesn't get on my fabric or threads. Oh well. I am careful and I enjoy these enough to use them anyway. My other Italian pair is by Premax, the 4.25-inch ring-lock pair, and aren't these space-age? These have a perfect brushed steel finish and that smooth action the first pair is missing. SWOOSH. Also, they are made in the village of Premana, Italy, which is near Lake Como, which is where George Clooney lives. So, these also have a touch of Hollywood glamour, haha!